It’s easy to forget, but there was an entire Oscars telecast before that whole La La Land / Moonlight debacle. We’re talking a solid five or six hours of people wearing clothes and then talking about them. If they were lucky or telegenic enough or connected to some kind of ABC show they got to read joke-like sentences off a teleprompter before handing out mementos and knickknacks. It was just a big huge night of classic old-school Oscaring, the likes of which your grandparents used to love and ignore. And then the thing at the end happened, the thing that people will always talk about forever, or until Western society crumbles, so maybe through the summer (if we’re lucky). Warren Beatty was handed the wrong envelope, he totally hung Faye Dunaway out to dry like it was 1968 again, and the wrong movie was given the big award for about forty seconds or so. The moment was pregnant with all the drama of the election and the NBA Finals and the Super Bowl and the Royal Rumble, but without any of the significance. It’s something Oscar fans will remember forever, along with the Native American Marlon Brando kidnapped and that time Peter O’Toole said “fanny” on live TV. Of course, in the high-speed internet age of 2017, the reactions came rapid and raging, appearing directly on the phone that is our only window on the world, the phone that is our sole contact with the human race. Some of those reactions finally reminded us, after so long, what it feels like to laugh. 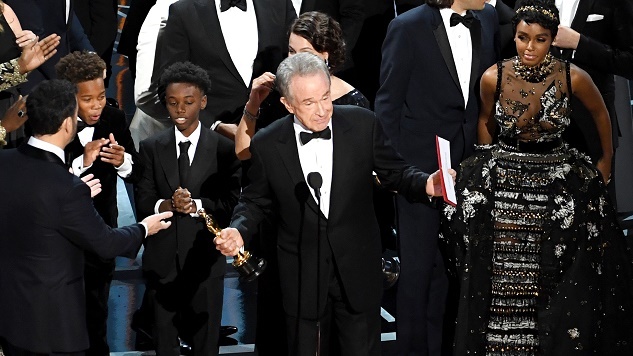 Here are the best of those fleeting vestiges of humor and humanity; here are the best of the tweets about the 2017 Oscars.